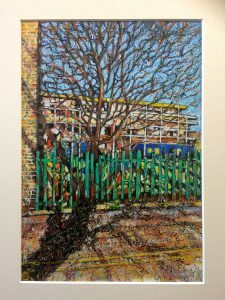 Tree Shadow mixed media on paper mounted 12″ x 16″ £250. This image of a tree amongst building in the Jericho are of Oxford plays with the idea of trees among buildings or is it buildings among trees? Where does the shadow of the tree from behind me merge with the tree in front? It is also part of a series of paintings I have done which I have called ‘Oxford under wraps’-the city as a building site with the old emerging into the new. So it is all a play of appearances which the style echoes. This painting was exhibited at the Jam Factory, Oxford, RWA Open Exhibition, Bristol in 2016 and Oxford Art Society Open Exhibition 2017 and will be shown at SOCA during Artweeks in May 2018.